Last month Kamigu, an online store selling creative paper products, opened its virtual doors for business. Paper vases, dioramas, wall hooks, coasters, figurines and packaging all created by Japanese designers are on sale. Providing a platform for designers to get their work out there in the world, Kamigu is making high design affordable and accessible. We were particularly enchanted with the Architecture Model Series, designed by architect Naoki Terada, which are 1/100th scale dioramas of typically Japanese scenes like cherry blossom picnics, construction sites or Tokyo streets. 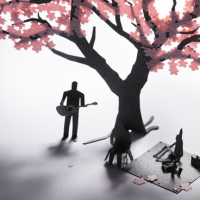 Of course beautiful paper art is nothing new to Japan. This is the birthplace of washi and origami after all, but there has recently been a resurgence of interest in the possibilities of paper. 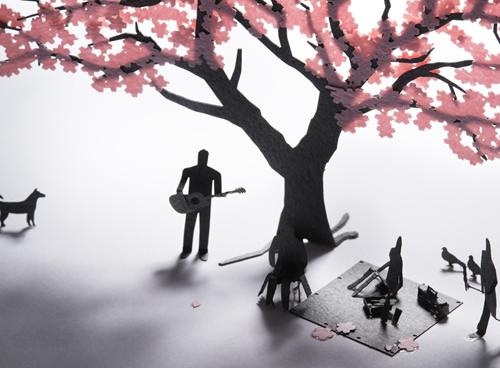 Japanese designers, such as Shin Tanaka and Tetsuya Watabe (Kami Model), have enthusiastically taken part in the global paper toy movement, and we feel Kamigu is just the next step along that journey. Cheap to produce and ship, paper designs are the perfect medium for creators who want to play around with new ideas. Take the Nanibird, an avian paper toy template from Japan-based illustrator Josh McKible. On the Nanibird web nest, designers working within the parameters of Creative Commons showcase their original versions of this “Urban Paper” creation, and most of the designs are free to download so you can assemble your very own Nanibird. Fans of origami might also want to check out the work of German artist Anja Markiewicz, who has been creating what she calls “Nano Origami” from teensy pieces of paper. Created using a toothpick and a lot of patience, she then encases her work in plastic orbs that can be worn as jewelry. Those with an interest in paper arts can also visit the Paper Museum in Tokyo’s Kita Ward. The museum’s permanent collection houses over 40,000 paper-related items and visitors can find out about washi as well as modern paper-making techniques there. They even have a paper-making workshop on Saturdays.